IPS Group are pleased to have been involved with this educational building in Wokingham, working with CityAxis of London. IPS provided the full design of the roofing and cladding and provided full detailed CAD drawings and structural calculations. The roof of this new build extension is fitted with Kingspan 71mmTopdek Composite Panel finished with Rubberfuse Light Grey TPO Membrane. The panel is fitted over cold rolled purlins and cleats manufactured by BW Industries, all installed by IPS. The roof is complimented with an access hatch supplied by JetCox to enable safe and easy access to the roof for inspection and maintenance, together with a QBM Soter safety line system. In addition to the use of an environmentally friendly roofing membrane, the environmental credentials of the building have been enhanced with the installation of the 9.5kwp Solar PV System, the complete system had been designed, supplied, installed and commissioned by IPS Group. The panels used are the latest Thin Film Technology from BIPVco. The building is made particularly aesthetically pleasing with the addition of the Alupanel Rain Screen Cladding System. 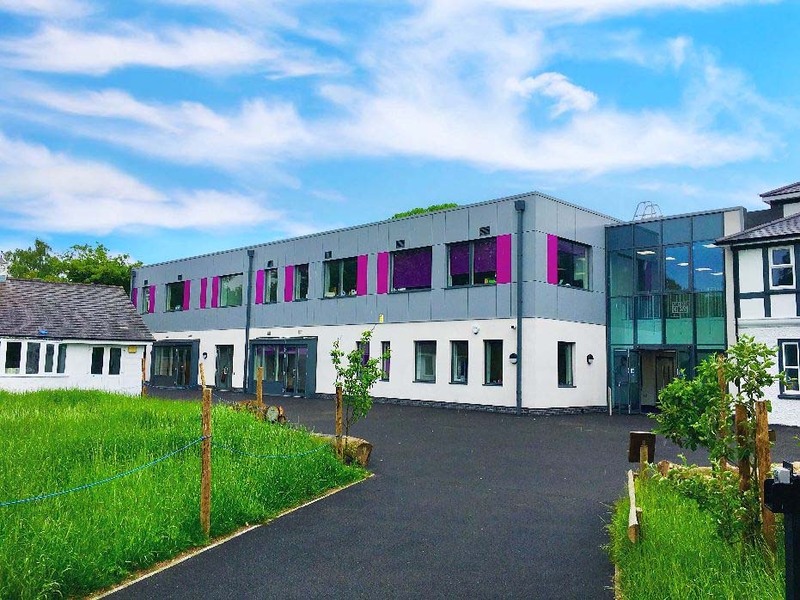 IPS Group fitted the whole Cladding System including SFS from BW Industriales, Nvelope support and bracket system and 60mm Kingspan K15 Rainscreen Insulation, FR Core ACM rainscreen cladding from Multipanel with purple colour match to the schools logo to the client’s specification.